-Planning Support – Mr Young has worked alongside both the subject leader and school staff to develop high standards of quality planning. -Lesson Observations – Staff have had the opportunity to collaborate for lesson observations. This has involved the joint planning of lessons being taught by the member of staff and then by A. Young or vice versa. Following on from the lesson, feedback was shared and targets agreed. -Curriculum Planning – A. Young has supported our subject leader in developing a broad but balanced LTP for across the school. -Specialist Lessons – A. Young has also delivered specialist sessions for the children. -Resources / Transport – the link with Beacon Hill School also gives us access to a Gym, AstroTurf Pitches, Football Pitches and Tennis Courts. Transport to use these resources in via the Beacon Hill School minibus. -Competition Coaching – A. Young supports the subject leader in the delivery of in-school and after-school training sessions prior to sports competitions and festivals. The next stage of this partnership in 2018-19 is for Blennerhasset School staff to take PE forward independently. -This collaboration will involve the development of a Young Sports Leader Programme involving the real life skills of; completing a job application, interview process and training before leading sports competitions for local cluster schools. -Mrs Davies will be supporting Mr Young this year in the organising of cluster sports competitions to ensure that we could run these events ourselves in the future. -Mrs Davies will also be deepening and updating her own subject with the support of Mr. Young so that we will be self-sufficient in supporting our own staff with delivering high quality physical education. We are part of the ‘Allerdale Schools Sports Partnership’. 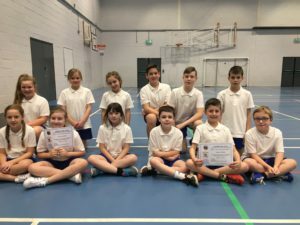 Through this programme we receive a variety of sports coaches – Multi-Skills, Kinder Cricket, Kwik Cricket and Tennis – into school at various times throughout the year. These coaches provide sessions for children from Year 1 – 6. The next stage of our development within the use of specialist coaches is to widen the skill set currently offered. We are in the process of approaching new coaches who offer new experiences for the children. All children in school from Reception to Year 6 are involved in swimming lessons during the Spring Term. The children in Reception, Year 1 and Year 2 visit the local ‘Better’ swimming school for 6 weeks in Spring 1 and then children in Year 3, Year 4, Year 5 and Year 6 visit for 6 weeks in Spring 2. The children leave us in Year 6 with very high levels of swimming achievement including valuable lifesaving skills. Recently, we have upgraded our sports equipment. Our entire range of equipment is of a high standard and is suitable for children’s development in sport across the entire school age range. Our subject leader replaces equipment as and when required. This will continue to be an area that will be monitored. We also link with our local cluster schools which form the ‘Aspatria Small Schools Partnership’. This allows us to make inter-school links directly and arrange additional events for the children. These events are organised for a variety of age ranges from across the school and allow our children to work with different children from other small schools. We are registered with the ‘Sainsbury’s School Games’ website and this platform allows us to share our sporting calendar, register our School Games Day and currently we are working towards achieving the School Games Awards.